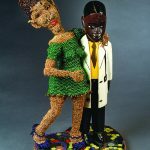 Contemporary sculptural works by Joyce J. Scott featuring meticulous beadwork combined with blown glass, molded glass components and found African wooden artifacts will be on display beginning August 27, 2015, at The University of Alabama Sarah Moody Gallery of Art. Scott will also lecture about her art, Wednesday, August 26, at 7:00 p.m. in 205 Gorgas Library. There will be a reception on Thursday, August 27 from 6:00 to 8:00 p.m. in the gallery. The curator, Patterson Sims, will lecture on the work of Joyce J. Scott on October 6 in Lloyd Hall 132 at 5:30 p.m. The exhibition will be on display through October 16. Scott’s art practice spans more than forty years, reflecting her African American, feminine and urban identity. She combines beauty and sophisticated craftsmanship with current cultural issues of race, gender and class. Joyce J. Scott is a Baltimore native and earned her BFA from Maryland Institute College of Art and M.F.A. from the Instituto Allende in Mexico. Her work is in numerous public collections including the Detroit Institute of the Arts; Metropolitan Museum of Art, New York; Museum of Fine Arts, Houston; and Philadelphia Museum of Art. Joyce J. Scott: Truths and Visions is organized by the Museum of Contemporary Art Cleveland and curated by Patterson Sims, independent curator. For a slide show of the installation in the Sarah Moody Gallery of Art, click here. Image credit: “Look Mom, A Doctor!”, 2008 by Joyce J. Scott (American, b. 1948), seedbeads, thread, wooden African sculpture, coins, glass. 17 ¾ x 10 x 10 inches. Image courtesy of Goya Contemporary.